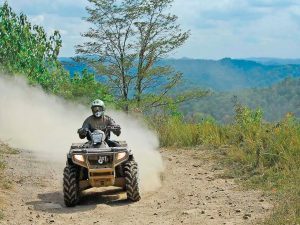 There is no doubt that riding an all-terrain-vehicle (ATV) is a thrilling experience, but it comes with its fair share of risks, which compels you to take responsibility for your own safety and that of the others. Complying with legal regulations and policies is the first step toward a safe ride so that you can enjoy this popular, yet potentially dangerous vehicle. Read our advice on safe ATV riding to learn how to make the most of your experience and avoid getting yourself and others in trouble. To begin with, although some states may allow children as young as 10 to ride an ATV under the supervision of an adult possessing a driving license, it is recommended that you should be at least 16 to safely ride one. It is only after this age that you develop the skills needed to operate such a vehicle and can be issued a safety certificate which enables you to operate an ATV on specialized trails. In addition to this, you should always ride an ATV which is suitable for your age group and size, as advised in the producer’s instructions and taught during the safety training. Failing to do so may result in difficulties handling the vehicle and can lead to unfortunate accidents. Keep in mind that whenever you ride an ATV on a public street or road, regardless of the time spent there and the reason why, you are required to possess a valid driving license since ATVs are meant to be used off-road. Although this may seem common sense, it is important to emphasize the fact that riding/driving under the influence of drugs or alcohol is a reckless behavior and is likely to get someone in the hospital or cause severe damage which you are going to be liable for. Some states require that ATV operators wear eye protection and ATV helmets at all times while riding. Choose a helmet which is the appropriate size for you, meaning that it should stay put when you are shaking your head. Also, secure your chin harness before each ride to spare yourself a lot of pain in case something goes wrong. We recommend that you go for headgear that is specifically certified by the Department of Transportation and that is fitted with a shield covering your entire face. Alternatively, you can put on a pair of goggles meant to protect your eyes from rocks and dust on the way. It is also generally recommended that ATV enthusiasts wear long sleeves and pants, in addition to gloves and boots that go past the ankle. Equipping yourself with all the right safety and protection equipment is next to useless if your ATV breaks down due to technical issues during your ride. For this reason, it is essential to inspect your vehicle every time before setting out on a journey. Pilots do it, sailors do it, you should too. Among the most important elements to check are the brakes and the throttle, the brake lights and the headlights. Always make sure that the air pressure in your vehicle’s tires corresponds to the manufacturer’s instructions. Very importantly, never begin a ride unless you have enough gas in your tank, as well as full brake and coolant fluids. You ATV is going to be riding on bumpy, not so well-kept roads, which makes it prone to deterioration unless it receives proper maintenance. Turn this brief check-up into a routine to keep it running at optimum parameters and to keep your rides safe. Weather conditions leave their mark on the roads and can influence the quality of your ride. Heavy rain and floods will turn the trails muddy and getting water in your engine may cause severe damage. The last thing you want is your ATV to start floating, which can happen if it rides into water or mud that is too deep. Likewise, strong winds coupled with high speed while driving can knock you down. While out in the “wild” you need to remember that off-road trails can be rather tricky and bumpy. Look out for obstacles you may trip on, animals which may cross your path, or branches getting in your way. Equally important, stick to the designated roads, as driving your ATV on a non-permitted road puts you at high risk of being tripped over by other vehicles, not to mention receiving a fine. 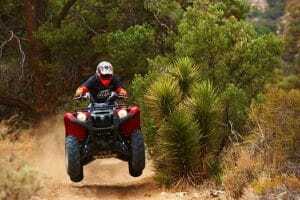 Knowing how to put into practice the right techniques while riding an ATV can help you avoid common mistakes which lead to accidents. Avoid the temptation to take along a buddy on your single-person ATV. It may sound fun to hit the road with a friend, wind blowing in your hair, but you are exposing both yourself and the other person to great risks by doing so. Even if you take all the safety precautions and act as an exemplary driver, accidents can happen when you least expect them. Should you be involved in an unfortunate event which results in injuries done to you or to other people, as well as damage to their or your property, insurance can bail you out of a lot of trouble. 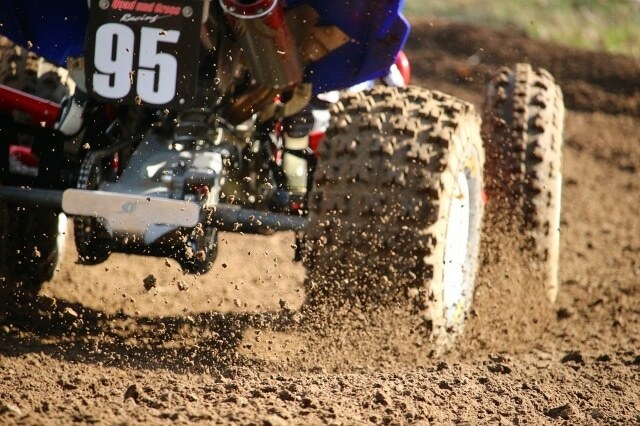 Insurance can offer you protection against many risks associated with owning and operating an ATV and, depending on your particular needs and choices, can cover one or more types of liabilities. Medical bills and property losses incurred to third parties in accidents you cause may be accounted for by your insurance policy, and the same goes for court costs if you are sued. Another type of insurance you are advised to consider is collision coverage, which allows you to recover repair costs for your ATV should it be involved in a collision with another vehicle or object. There is also an option available for those who wish to insure their four-wheeler against a wider array of risks. It is called comprehensive insurance and protects your property against damaging events other than collisions, such as flooding, vandalism, theft, flooding or fire.